Quickpoint Makes Your Client Healthier? Sure. A fast search easily locates an article on just how icky cellphones can get, they seem to be a breeding ground for germs. In an office environment this is yucky, in a medical or childcare environment, it borders on very dangerous. I will leave it to others to describe what all we can be carrying around on our phones; this is a blog on promotional items, a bit more mundane than medical science and prevention. Well at least it was. Enter the SafeAd Cell Phone Pad from Quickpoint. This item is designed to protect your smartphone face from the growth of harmful germs and bacteria. Ok, how? The SafeAd line from Quickpoint features something called AgION™ Antimicrobial Protection, which safely inhibits the growth of bacteria, mold, mildew, yeast and fungus on the surface of products into which it has been incorporated. The idea is rather basic. AgION™ technology coats items with a crystallized powder that contains silver ions. These microscopic ions are released slowly over the life of the product and have a harmful effect on bacteria, i.e. they kill it. The technology is approved by the EPA, and has been reviewed by the FDA. Quickpoint offers a much fuller explanation of what is actually going on at their website. Additional information can be located at the AgION™ site as well. 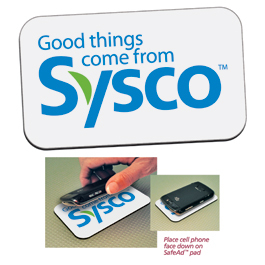 As a promotional item, the SafeAd Cell Phone Pad has a couple of natural audiences beyond the obvious use as a giveaway for phone retailers and manufacturers, specifically I would suggest to hospitals to add to current clean your hands programs, call centers or any other work environment where a lot of people share a small work area, and schools, with their large imprint area SafeAd Cell Phone Pad is a great medium on which to bring import school information for the incoming freshman class. Even better hand these out at the school clinic as part of your campus outreach program. What else to say about the product besides it protects cell phones from the growth of harmful germs and bacteria? Well it is Made in USA, provides an anti-skid rubber base, protects the face of cell phones from scratches, gives great desktop advertising exposure boasting a 2-1/2” H x 4-1/2” W imprint area. Each unit comes poly bagged with instruction card. Also, unlike Quickpoint’s mug, the SafeAd Cell Phone Pad is not defined by Quickpoint as a “green” promotional item. If you are a promotional items distributor looking for more information on QuickPoint items contact Duane Mayer. If you are interested in these items to promote your own business contact your local promotional items vendor or email info@proformagreen.com for information and pricing.